This rare bottle comprises a bulbous base fashioned from plain zinc sheets shaped and soldered together and a neck and lid in high grade cast and chased silver. The faceted neck rises to an acanthus leaf border. The lid, in the form of an architectural Mughal-like dome, rises to a gilded bud like finial above a petal flourish. 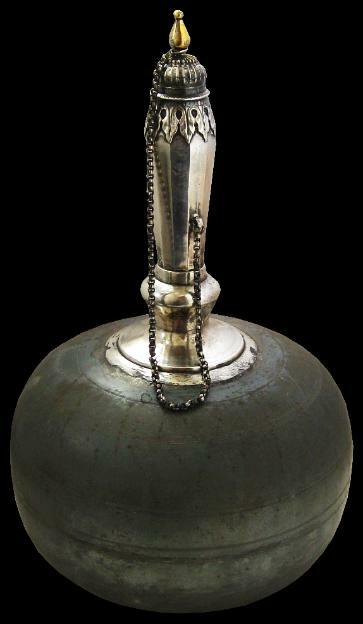 The silver mounts and chain are similar in form and style to a silver perfume bottle with a chain ascribed by Zebrowski (1997, p. 47) to Rajasthan, circa 1700. The lid is attached to the neck by means of the original silver chain. Bottles such as this example were used to cool liquids – water or perhaps wine. The zinc bases often were encased in cloth which was then soaked with a water and saltpetre solution to chill the contents. Zinc as a metal, was prized throughout the Islamic world in the seventeenth and eighteenth centuries. By the second half of the seventeenth century metalworkers had discovered that zinc was quite malleable at only a little above the boiling point of water so making vessels from sheet zinc became more widespread. An example of a similar style cooling bottle is illustrated in Terlinden, C., Mughal Silver Magnificence: 16th-19th Centuries, Antalga, 1987, page 114. An Ottoman example is shown in Christie’s London, ‘Islamic Art and Manuscripts’, October 12, 2004, lot 126. The perfume bottle referred to above is in Zebrowski, M., Gold, Silver & Bronze from Mughal India, Alexandria Press, 1997.